Player with great athletic and physical ability, called the "lungs" of the Netherlands because he worked tirelessly around the field, pushing, stealing balls up, in short, a complete player and copy that was one of the architects with the Johan Cruyff called "Clockwork Orange." 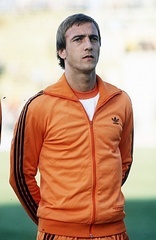 Neeskens international debut was at 19 years and wore the shirt on 49 occasions for Dutch. From humble beginnings, started in football from an early age and at fifteen years and was known in the second division team in his hometown. There he found the coach Rinus Michels, a few years later, he joined Ajax Amsterdam, with whom he would win three European Cups, two Dutch League, one Intercontinental Cup and Super Cup. If Ajax had coincided with the great Johan Cruyff in 1974 moved with him to FC Barcelona for five years, which is still remembered by the fans. Then came the New York Cosmos. In 1985 he returned to play in Holland to retire from football a year later. In the 1974 Olympic Games Neeskens was a finalist with the Dutch team in a match against Germany in which the Dutch made the best game, but the Germans ended up taking his second world cup. Neeskens addition at this tournament was the top scorer with Polish Smarzach. In the Dutch 1978 world finalists were again, standing at the gates of the title a second time. For all these merits Neeskens is still regarded as one of the best Dutch players of all time. NEC is currently coach of the Dutch and the Dutch national team assistant during the 1998 World Cup and European Championship final.